Paperwork can build up quickly. Before you know it, your office is overflowing with piles of reports, records, invoices and plenty more. It’s imperative to stay organized and in control of it all, especially when tax season rolls around. Keeping receipts, bills and government forms in one place can make the difference between a lucrative, on-time tax filing, or one that’s missing important information and submission dates. Here’s the 5 essential packaging supplies for taxes and archiving that’ll help you survive a stressful financial season. Just like it’s a good idea to sort files by relevant categories, it’s also a good idea to store those files in a relevant container. Storage boxes have multiple features designed to make storing and carrying files a much easier affair. Reinforced handholds make boxes easier to carry, while removable lids make it easier to load and remove files later. Colour options can help create a quick, visual system for organizing boxes, and pre-printed areas are available for writing on. When it comes to essential packaging supplies for taxes and archiving, plastic bins are high on the list. Solid, one-piece construction means there are less potential weak spots in the body of the bin, and moisture is more easily repelled than in corrugate-based containers. Locking lids are available in a number of styles, and each helps to keep out light, dirt and dust from the contents inside. Varying colour choices and bin sizes mean grouping, organization and storage space is more easily controlled. 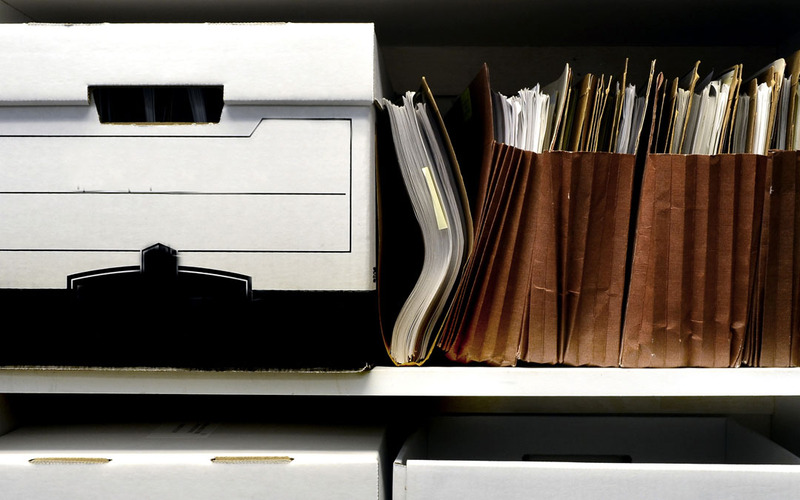 Though storage boxes can help group documents together for easy retrieval, file folders can help make your filing system as specific and in-depth as you’d like it to be. Sorting by first letter, last name, date or any other category is much easier when you use properly-labeled file folders. While the standard folder is the most commonly used, hanging-style folders that sit on rails are also a solid choice—they’re ideal for easier moving around of folders and faster access to files. Multiple colour options can also help you create filing systems based on any category style you like. These guys are essentially sealable folders. They’re ideal for grouping together and occluding sensitive files like financial or legal documents—either to store away in those file boxes you built, or to make the short trip to your tax accountant’s office. Multiple colour options can be used as a quick and easy filing system, and varying closure styles mean you can decide just how eyes-only a bundle of documents is. If corrugated boxes are the staple of the packaging world, then copy paper’s the staple of the business world. Even in these days of backup hard drives and cloud saving, paper is still king when it comes to record keeping. Any important files you receive will likely be in hard copy, and you’ll want to print out versions of any digital records you have. Don’t forget to keep your printer stocked with ink! Between the sheer amount of paperwork we all have, and the stress of a busy tax season, it can be hard to stay organized without a little bit of help. By identifying the packaging supplies for taxes and archiving that’ll benefit you most, you can make short work of all those tall stacks of records. Happy organizing, and happy filing!